Here is a really neat and useful pistol bag. The Galati Pistol Pouch Magazine Holder is a 2 gun case that can also hold 7 magazines and a few boxes of ammo. 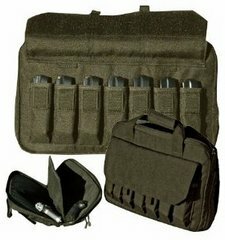 This is a military style gun bag and of similar quality. 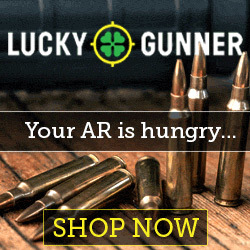 This is a great small range bag where you can take 2 handguns and ammo to the range but you will not be able to fit ear muff type hearing protection in it. I just use the foam ear plugs and they can fit in any pocket. It’s also great for “Urban Ops” type excursions where you may need a backup gun as well as a primary. It carries everything you need to support 2 weapons. The Galati Pistol Pouch is made from 1000 Cordura Nylon with YKK lockable zippers. It has a Wrap-N-Go handle and a shoulder strap. This pistol pouch is first rate all the way. The main compartment has an internal divider which creates 2 separate padded compartments for 2 pistols. The back is Velcro for support of Molle pouches. A front pocket features an ID window and secures 7 magazines or other small items like flashlights and knives. A rear outside padded pocket can secure a firearm or ammo or whatever. This entry was posted in Gun Cases by admin. Bookmark the permalink.